This Christmas snowman ornaments with lights is about 7.5 inches tall and made up of two Styrofoam balls, one bigger than the other and covered in a white cloth. She is dressed warm wearing a sparkly white ski cap with a soft white cloth trim and a white pom-pom at the end. Her matching white sparkly vest has a faux fur cloth trim and a white down feather scarf wrapped around her neck. 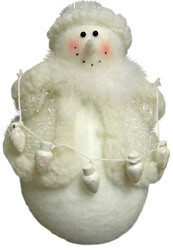 For arms, Frosty ornament has small wooden twigs which have a string of white glittery lights tied to them. It can stand freely on a flat surface or hung on your Christmas tree. Triple snowman Decorative Folding Screens.